As you will be aware, anglers have been concerned about the environmental damage being caused to the Eucumbene River and its surrounds during the annual spawning run. Nearly all of this damage has been caused by the large number of vehicles that descend onto the river banks during wet times. As a result of concerns for the environment by anglers the Monaro Acclimatisation Society (MAS) seized the initiative and convened a meeting of stakeholders to discuss the matter on 30 March 2016. That meeting was attended by NSW Fisheries, Snowy Hydro, National Parks, NSW Maritime, Chamber of Commerce representatives and anglers. The meeting was chaired by the President of the MAS. At the conclusion of the meeting it was agreed that some action had to be taken to stop the damage. A working group consisting of NSW Fisheries, Snowy Hydro and National Parks representatives was established to examine the options available, identify a solution and implement that solution. I am happy to report that after a year of hard work the preferred solution of limiting vehicle access at the Denison Campground by creating a car park there is now about to be implemented. Snowy Hydro has agreed to pay for half of the project and on Monday 20 March 2017, the NSW Fisheries Minister announced that the other half of the funding will be made available through the Recreational Freshwater Fishing Trust Fund. Anglers can expect to see work begin quite quickly and it is anticipated that it will be complete before the spawning run begins, subject to some favourable weather. The Working Group is now finalising the administrative arrangements for the new access regime and I expect that anglers will be advised soon on how this will operate and what special arrangements have been made for disabled anglers. I will take this opportunity to remind you that this was a project driven by anglers and coordinated by the MAS which will protect the spawning run for years to come. While many of us will often criticise Snowy Hydro it has been a pleasure to deal with them over this issue and I especially acknowledge their willingness to work with anglers and provide material support for the project. Things have Improved over the last week with plenty of rain and the lake staying at a good level good reports coming from, Buckenderra, Middling Bank, Bramer Bay, Rushes Bay, Frying Pan and up around Providence. Overall things have Improved and the rainbows are starting to come in. 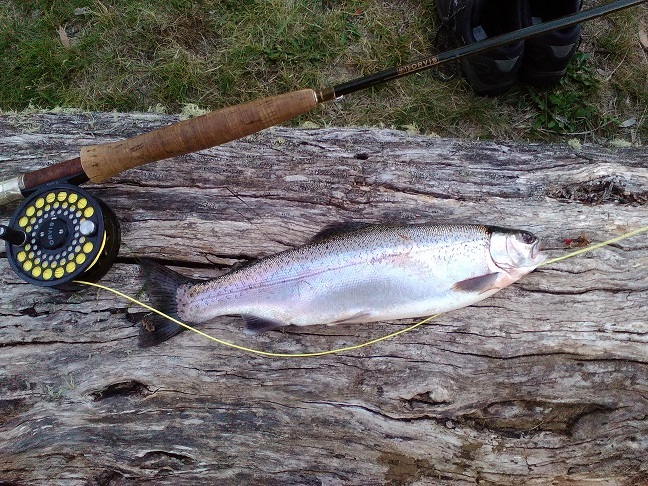 fishing at Jindabyne has been doing a lot better this week with some good reports coming from the western side and over at Kalkite mostly rainbows and a few browns. So if anyone has been fishing up that way a reports would be good thanks!! Just like Eucumbene things are looking good and the fishing has picked up with browns and rainbows the lake is staying at a good level and there’s plenty of food flying around late in the afternoon. Bait fishing is still at it's best with good reports coming in from Braemer, Middling Bank, rushes, Anglers Reach, Old Adaminaby and Buckenderra. Best bait is still mudeye's and worms. Mudeye's are starting to move and the fish are starting to get active Overall the bait fishing is great.